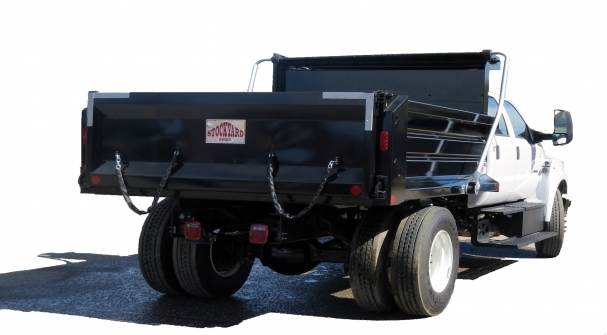 Ox Bodies® is excited to present our new Stockyard™ line of dump bodies. The Stockyard™ series consists of three different product offerings for the medium duty truck market. All three models are available in lengths of 9' to 12' (in 1' increments) and side heights of 18" to 36" (in 6" increments). The Bronze offering is the standard model designed for affordability. The Bronze model offers corrugated side panels, eliminating the excess weight from line posts without sacrificing any structural integrity. This unit is equipped with an underbody electric hoist featuring a sub-frame and a manual tarp. The Silver offering is the mid-level model that allows limited customization to better suit the user who is price conscious, but still requires specialization. This unit is equipped with a PTO (power take-off) driven underbody hoist (featuring a sub-frame) and a semi-automated tarp system. The body will feature corrugated side panels and a frame structure consisting of cross-members on 12 in centers. The Gold offering is a customizable model designed for users who require specialized features and options. This unit is equipped with a front mount, telescopic hoist along with a semi-automated tarp system. The body will feature formed side panels and a formed top rail along with a cross-member less frame structure. The standard list of options that accompany the Silver model will be available on the Gold model as well as additional body features including, but not limited to, sloping side walls and a variety of floor material/ thickness options.